Unfortunately, what I say is true. I’m becoming insane stressed more and more lately, which, while having the unhappy effects of general crankiness and dark circles, has the benefit of me losing weight. Which is frankly ridiculous, but tell that to society. I understand the importance of school, to be educated, and therefore have a job that pays a certain amount of salary to keep me alive for about fifty years, but quite honestly, it’s rather intense for it to sprout dreams of riches and fame while you’re young, and squash it in middle school, as you see your genius classmates seperated from the lowly commoners. To establish hiearchy among teenagers is a terribly cruel thing to do. But I desist. My school isn’t one of those horrible places mentioned in a typical chick read. We don’t have the cruel, evil, beautiful, and rich cheerleaders. We don’t have muscular, idiotic jocks. Sure, we divide into our seperate groups, but in the end, no one really bothers to bully anyone. Of course, there are those really weird kids, and then the kinda nerdy ones, but who cares? The “popular” kids are friends with all of them. So, why do people say that high school establishes hiearchies of the modern society? From what I see, there’s just too many kids to keep track of, to see who’s popular and who’s not. So, to finish my rant here, I want to say that the people who write those books are stupid. Those who makes the TV shows, the movies, even video games, are really really idiotic. Why endorse these things when kids are what they are? Anyways, this post is mainly to stress out the fact that I’m being tortured to death slowly, and that I am taking advantage of a strangely non-tortureless Friday. Nevertheless, I hope all of you are enjoying your weekends. I’ll try to post something about various obsessions in my life, and I’ll see you again soon. My funeral is this Thursday. I have come upon a vision. Or a prophecy, if you will. Doomsday for all students of my district will be this Thursday, August 12th. We will be killed through a rampage of teachers, notebooks, teachers, pens, pencils, etc. I had a school check in day, and I almost sobbed. Textbooks, classes, binders, etc. I know I shouldn’t hate school, but…..
DUDE. DON’T TELL ME TO LIKE SCHOOL. 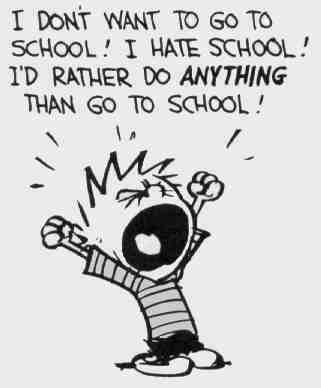 I BET YOU HATED SCHOOL AS A LITTLE KID. I’M A LITTLE KID, DUDE. You hear that? It’s me slowly dying. So, this post is one of despair. Because I virtually spent the summer doing nothing. And now I’ll be going back to school. And doing PE. And schoolwork. And math. Oh, forget it. School, in the definition of Wiki, is basically this: A school is an institution designed for the teaching of students (or “pupils”) under the supervision of teachers. I actually used to like school. As a kid. When I didn’t have to study. And getting a 90% was a shocking incident for me. I was a little stupid. BUT. I will be optimistic. Yes yes yes. School is GOOD! It helps me LEARN! And not get a job at McDonald’s! Yeah! Um, I’m just gonna go collapse into a heap of sobs, cause this clearly isn’t working out. I’ll let you know if I survive. Reviews, complaints, spite, and the usual. I find it atrocious to find that it is currently midnight, I have school tomorrow, I have not yet taken a shower, I am not at all ready for my classes, and that I am in the middle of a movie marathon. And yes, I am also writing a new blog post. Lately, I’ve been heading toward blogs for comfort. I’ve actually found a couple that induced me to laughing fits. Its much more reassuring that people who write these posts have written them a day ago, are not dead, and did not go through a terrifying amount of time with agents, editors, and publishing markets to get them out in the world. Which brings me to my next case in point. As I mentioned before, I’m having a movie marathon. It started with Where the Wild Things Are (boring, dull, not worth mentioning) which I watched purely for the benefit of my friend. When she left, I finally got my hands on Sherlock Holmes. It used too many scientific words, where phrases like “it stops the pulse for a period of time” would have sufficed. Their accents had me losing half of their dialogue. Sherlock Holmes is a long, lanky character, not the short, stout, wild haired Robert Downey Jr. And, quite honestly, he is not that attached to Watson, no matter how fond of him we all are. To be frank, it was rather gay. But those are my only complaints. I found Rachel McAdams wonderful, Jude Law refreshing, and Mark Strong creepy. Robert Downey Jr. was also fantastic. Even though he did shy away from the traditional, gaunt Sherlock Holmes character, I did enjoy the humor he put into the role. He was quite lovable, don’t you think? To be honest, I think I started this post out of spite. For my math teacher. She’ll go crazy if she sees even one student sleepy in her first class. Do you think she’ll accept my excuse of movie marathons and the need to fulfill my audience’s craving for a new post at midnight?